San Jose, California – October 29, 2017. The JM Internet Group (https://www.jm-seo.org/), a leader in online internet marketing training, is excited to announce that the company’s book on search engine optimization for small business owners and marketers has topped five hundred reviews on Amazon. This milestone has been achieved prior to the publication of the 2018 edition, expected out by the end of the year. This entry was posted in Blog, Press Releases and tagged Search Engine Optimization, SEO, SEO Books on October 31, 2017 by Jason McDonald. San Jose, California – March 7, 2017. The JM Internet Group, a leader in SEO training online, is proud to announce that it is soliciting submissions for its popular list of SEO Books. In addition to publishing the best-selling SEO Fitness Workbook 2017, the company maintains a list of top-rated SEO books. The purpose is to help small business owners and marketers educate themselves on how to “do it themselves” in terms of search engine optimization. This entry was posted in Blog, Press Releases and tagged Search Engine Optimization, SEO, SEO Books on March 13, 2017 by Jason McDonald. This entry was posted in Blog, Press Releases and tagged Search Engine Optimization, SEO, SEO Training Online on February 28, 2017 by Jason McDonald. San Jose, California – February 22, 2017. The JM Internet Group, a leader in online SEO training, is proud to announce an an important review milestone for Jason McDonald’s 2017 book on search engine optimization, the SEO Fitness Workbook 2017. This popular SEO book has topped forty review on Amazon.com, and is scheduled to come out, soon, in audio format. This entry was posted in Blog, Press Releases and tagged Search Engine Optimization, SEO, SEO Books on February 22, 2017 by Jason McDonald. San Jose, California – January 31, 2017. The JM Internet Group, a leader in online SEO training, is proud to announce an update to its popular list of best SEO conferences for 2017. SEO or “Search Engine Optimization” is the art and science of propelling a company, product or service to the top of search engines such as Google or Bing. In addition to online training, blog posts, and webinars, many practitioners find it useful to attend real-world trade shows on SEO. This entry was posted in Blog and tagged Search Engine Optimization, SEO, SEO Conferences on January 30, 2017 by Jason McDonald. This entry was posted in Blog and tagged Search Engine Optimization, SEO, SEO Books, SEO Fitness Workbook on September 14, 2016 by Jason McDonald. This entry was posted in Blog and tagged Search Engine Optimization, SEO, SEO Conferences, SEO Trade Shows on August 22, 2016 by Jason McDonald. This entry was posted in Blog and tagged Blogging, Search Engine Optimization, SEO on March 14, 2016 by Jason McDonald. This entry was posted in Blog and tagged Search Engine Optimization, SEO, SEO Consulting on February 3, 2016 by Jason McDonald. SEO (Search Engine Optimization) is a subject near and dear to my heart. As the primary teacher, organizer and cheerleader of the JM Internet Group, I (of course) have my own SEO book for 2019: The SEO Fitness Workbook. Updated for 2019, it comes with worksheets and links to videos as well as a step-by-step methodology that starts with keywords, takes you through ON PAGE SEO such as HTML page tags and website structure, and ends up with OFF PAGE SEO (links, social mentions, and social authority). That said, I often get asked by my students for a list of the best SEO books for 2019. Here’s my updated list of books on search engine optimization. If you have a recommendation, please contact me. 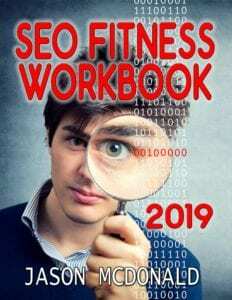 SEO Fitness Workbook: 2019 Edition – While many books on SEO sell for $2.99 or are even free, the SEO FITNESS WORKBOOK is priced at $39.99. It’s not cheap. It’s worth it. Here’s why. 1) Basic, practical advice – the SEO FITNESS WORKBOOK leads you step-by-step with an emphasis on DOING SEO not just understanding SEO, 2) The SEO TOOLBOOK – it includes, for free, the massive SEO Toolbook, 3) Worksheets – throughout, the book points to ‘howto’ worksheets that you can download and complete. SEO For Growth – Authors John Jantsch and Phil Singleton have brought a new book from a more ‘marketing’ perspective to the area of search engine optimization. They see and advocate the value of organic SEO efforts, but are a somewhat lacking on technical details and a systematic approach. The Art of SEO: Mastering Search Engine Optimization – Eric Enge, Stephan Spencer, and Jessie Stricchiola have brought us the ‘Bible’ of SEO. This is a very, very, very, very detailed book about technical SEO. What’s a canonical meta tag? Are 301 redirects better than 302s? How should you deal with duplicate content, and is correlation really the same as causation? Nerd alert: this book will give you the gory, gory details of SEO at a technical level. Excellent book for those who know the basics. Published: 2015. SEO Decoded: 39 Search Engine Optimization Strategies To Rank Your Website For The Toughest Of Keywords – Shane David brings us some strategies to help rank on difficult keywords. The book covers the basics of On Page and Off Page, and includes a chapter on WordPress SEO. It also has a list of tools. SEO: Marketing Strategies to Dominate the First Page – Grant Kennedy’s 2016 SEO book begins with some history about SEO, especially so-called ‘White Hat’ vs. ‘Black Hat’ strategies. He gives you tips and strategies, and covers the basics of AdWords at a conceptual level. SEO Myths and Half-Truths: Slice through the Veil of Misinformation to Uncover the Secrets to SEO Profits – David Hood brings a dose of cynicism to the books on SEO. This book discusses the myths and half-truths that dominate the public information on SEO. What’s good about the book, therefore, is that it exposes you to the idea that a lot of what is taken as ‘true’ about SEO isn’t true at all, and/or there are a lot of huckster SEO people out there, so buyer beware. It includes some coverage of how to hire an SEO expert. Internet Marketing 2016 – Quick & Dirty Online Marketing Strategies To Get Tons Of Traffic – Uday Shankar Byri has brought us a short quick book that crosses social media marketing and SEO. 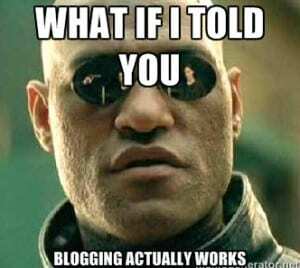 He explains, for example, how to write ‘killer’ headlines for your blog posts that not only show on Google but get a lot of social sharing. He covers podcasting, viral marketing, and even SlideShare as tactics. So, rather than really be a book about SEO, this is more a book about social media and content marketing. It’s the new, new thing! Seo: Seo Bible & Tips – Google, Bing, Yahoo! – Published in May, 2016, SEO: SEO Bible & Tips is a short, sweet to-the-point booklet about SEO. It has a heavy emphasis on content and content-marketing, and is a bit short on the technical details such as tag structure on pages, and the site content structure as a whole. If you’re looking to understand SEO-friendly content marketing, it’s a good investment and at its price point, why not? Ok, before you buy all the best SEO books for 2018, step back for a moment, and think about the big picture. Your strategy to approach the optimization of your website, vis-a-vis Google and Bing. Here are some steps. First, write down your marketing goals. Who are your customers? What do they want? How does what you sell match what they need? Second, figure out the keyword connection points. SEO is all about search, so they must be searching by some keyword that “matches” what they want to what you offer. You gotta know those keywords in a very, very systematic way. Third, after reading some of the books above, you should understand page tags and SEO. Inventory your current site content vis-a-vis tags such as the TITLE, META DESCRIPTION, HEADER, ANCHOR, and IMG ALT tags. Make sure you have your keywords in those tags! Inventory your website structure and links between pages. Inventory your home page content. Fourth, turn to links and off page SEO. Links are the currency of the Web. Who links to you, and why? How can you get more quality links? Take a look at social media: what are your social profiles like (especially Google+), and how can you improve them? Are you popular on Twitter? Finally, turn to Google Analytics and metrics. Measure your rank on Google, and measure your inbound traffic. SEO, like physical fitness, takes the desire to learn, the courage to implement, and the tenacity to stick with it. Finally, if you’d like to suggest an SEO book for my 2018 list of the best SEO books, please just email me your suggestion with a link to Amazon. Thanks! This entry was posted in Blog and tagged Search Engine Optimization, SEO, SEO Books on May 5, 2015 by Jason McDonald.